The middle section of our 2 week trip was to spend 5 days trekking into and within the Gunung Leuser National Park to look for wild orangutans, monitor their behaviour, collect poo samples (so we can see what they have been eating and if they have any diseases) and any new plant samples that they have been eating or using for medicinal reasons. This all goes towards helping the larger research carried out by OHP. 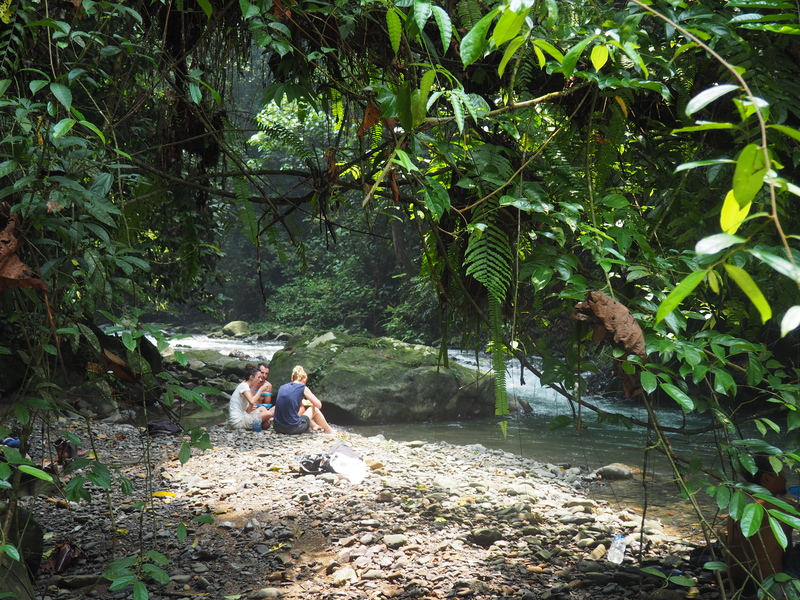 We’d already done a few hours walking near Bukit Lawang to see the semi-wild orangutans (see previous post) before we set off into the rainforest, big rucksacks strapped on and sandals ready for the river walking. But wow was it hard going! Coming back out was a thousand times easier, so I can only imagine a large part of it for me was being overwhelmed by everything. 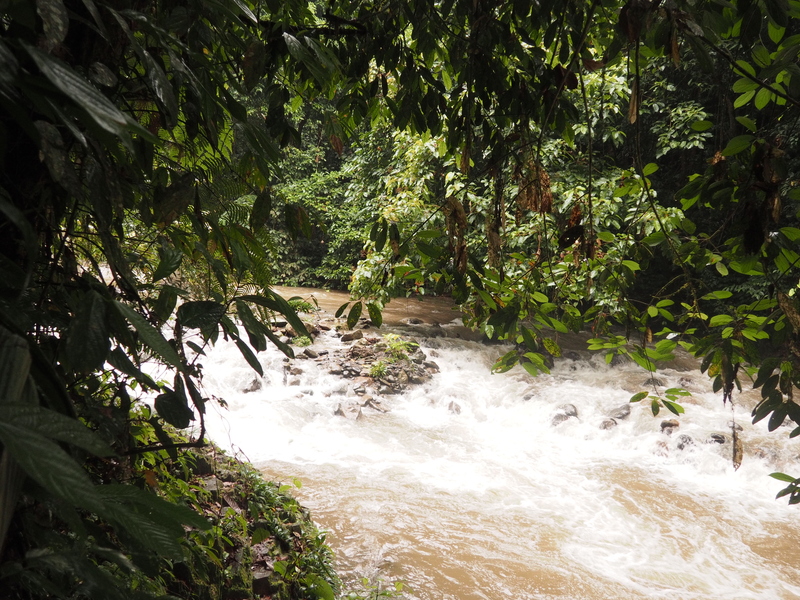 Carrying my larger rucksack, walking upstream in the river over big slippery rocks wearing borrowed sandals… not to mention just being in awe of the rainforest around me! I found it utterly exhausting, and after 2 or 3 hours walking in the river (I honestly can’t remember, it became a bit of a blur!) we finally made it to camp and collapsed. They always go to the same camp, which is an area near the river but a bit of a clamber up away from the water (we saw why a couple of days later when it rained heavily and the river rose dramatically), which has been cleared of trees and has a bamboo structure that they leave up. 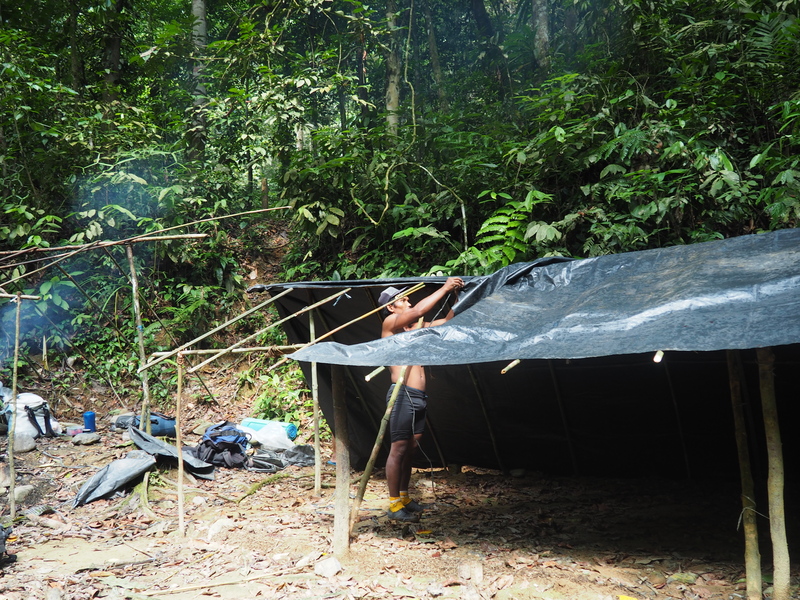 Then they just bring huge sheets of tarp, and using vine, they lash it onto the bamboo to create a roof, back and ground sheet, with the front left open. After a sit down and a biscuit (or 10), us girls went down to the river to wash and cool off. For religious and cultural reasons, women shouldn’t wear bikinis when swimming but rather be fully clothed, which made washing a right pain. 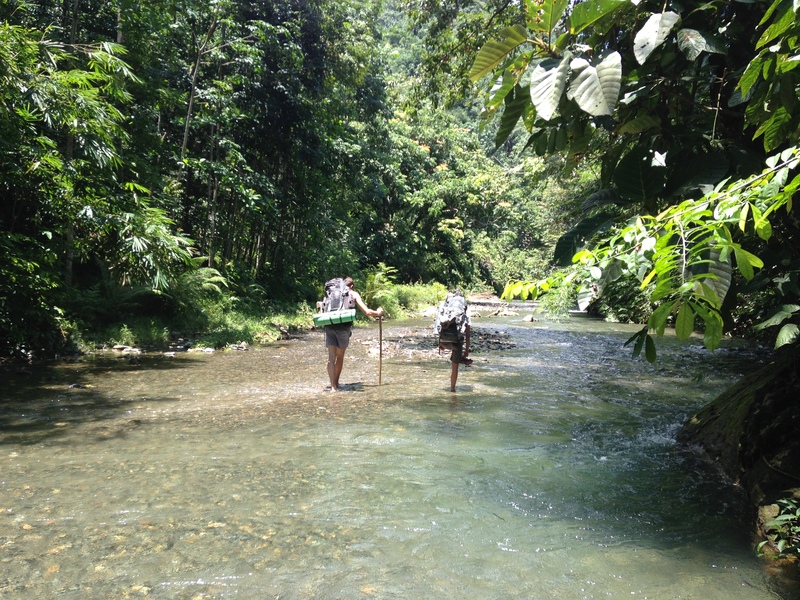 We decided to walk down river a little away from Wanda our guide and the two cooks/porters to make things a bit easier! We found a beautiful spot which was to become our regular bathing area. After using the rather brown well water back at base, dunking ourselves into the flowing clear water was amazing! The next day, after sleeping under our tarp listening to the lashing rain, the roaring river and the unbelievable orchestra of insect noises, we were up at daybreak and preparing for our first day trekking. I hadn’t quite appreciated what the terrain was going to be like – other than brief sections on the top of ridges, we didn’t ‘walk’ once the whole duration of the trip. 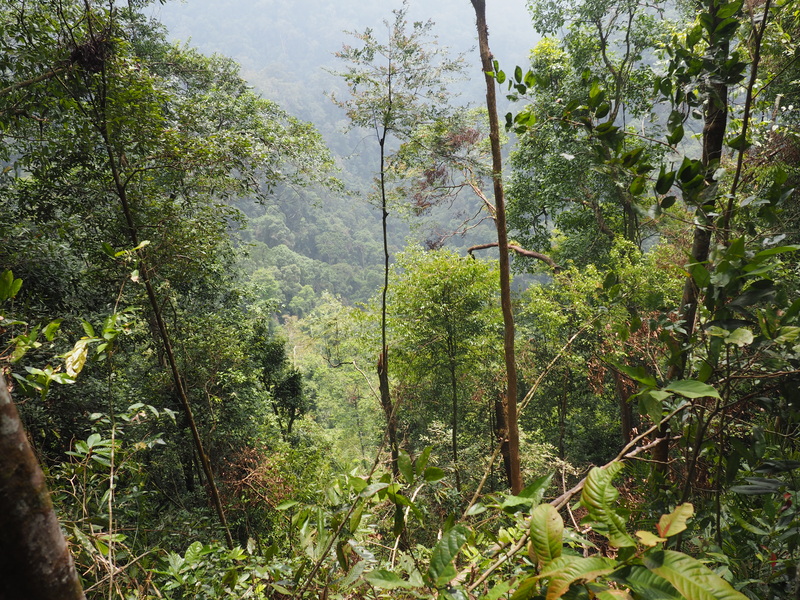 Instead, we were either scrambling up or sliding down huge steep mountain sides by grabbing onto the tree trunks, branches and any available plant, where every step you took slipped down a metre or so because of all the wet leaf litter and unstable ground. We found ourselves behaving like monkeys on the ground, each sliding step felt like swinging through air until you grabbed the next available tree (unless you were unlucky enough to grab onto the spiky rattan), a skill I certainly got a lot better at with practice. I’m not sure my expensive walking boots helped much either, Wanda was in flip flops and Nathan (another volunteer) went barefoot the whole way! Our first day gave us no orangutans, but we did see and hear a lot of gibbons, which gave us the classic jungle soundtrack while we clambered and skidded our way behind Wanda. The heat and humidity was intense, and our river bath felt just as good as it had done the day before. Day two was to be orangutan day! Unlike yesterdays non-stop sweaty hike up and down the slopes, within about 20 minutes of leaving camp, we found our first one, a male who was transitioning into being dominant, you could see the flanges starting to develop on his cheeks. We spent all morning watching him as he sat eating fruit at the top of the trees. Because the slopes are so steep, it means even though they sit very high up in the trees you can get really quite close by just going up the slope further. He made a few noises at us when we first arrived (kiss squeaking, a semi threatening noise) but calmed down after a while and carried on munching. We managed to get our faceal sample too, as well as make lots of behavioural notes. We even saw him smash open a bees nest to eat the larvae inside, something which Wanda said he’d never seen before! 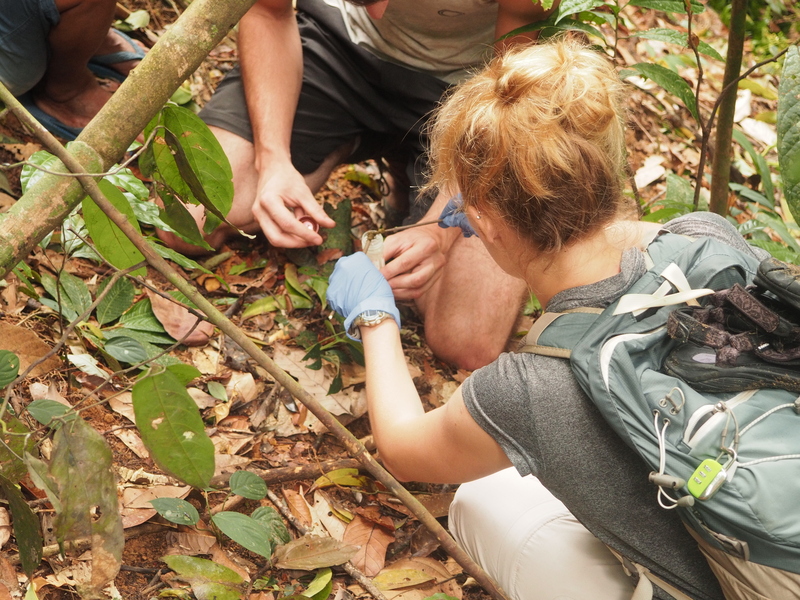 As we were collected the faceal sample, we had a look on the ground to see what fruits he had been eating (by what had been dropped from above) and realised it was asam gelugor, a juicy red flower we’d all tried in the forest a few days ago and tasted like a granny smith apple! It was amazing to not only know what this orangutan was eating, but what it tasted like too. Apparently anything an orangutan eats, we can also eat because we have such similar internal organs (I still wasn’t going to eat anything that hadn’t been approved by Wanda). After lunch by the river we came back to watch him some more, it was beginning to feel like a much more relaxing day than yesterday! 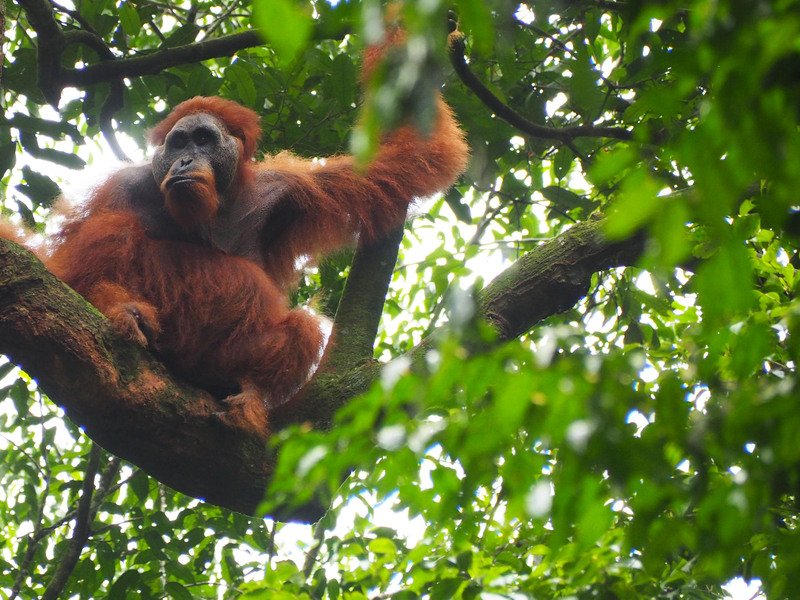 And then another orangutan was spotted moving through the trees. Because we’d spent so long watching this one, we decided to observe this new guy for a bit. 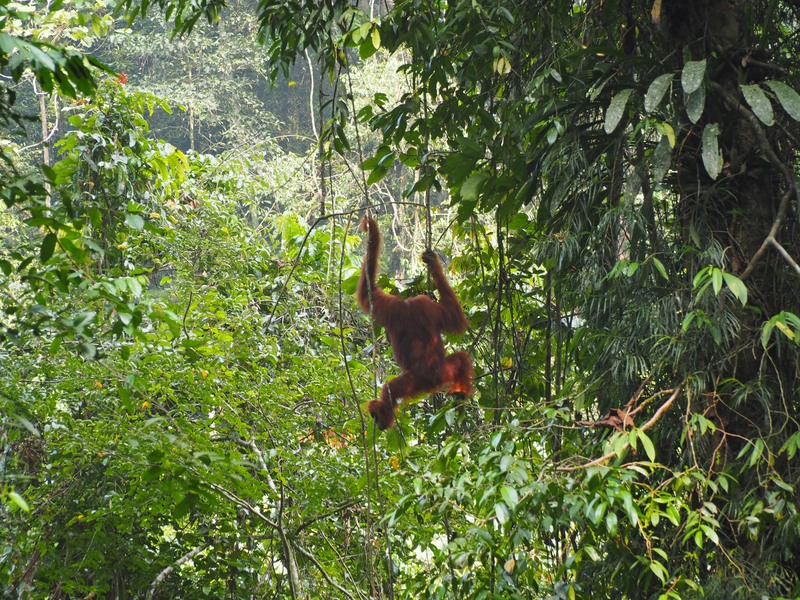 Once an orangutan is spotted, the idea is to follow it through the trees, which considering they are swinging effortlessly though the tops of the trees and we are sweating, slipping, sliding and clambering up and down the slopes on the ground, was incredibly tough to do! 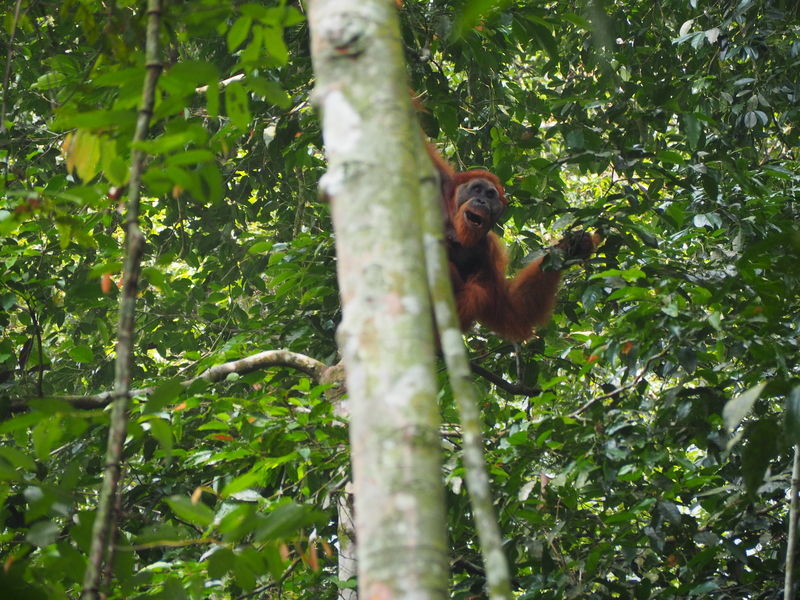 This second orangutan (also a male, probably younger) did not seem happy to sit and eat fruit while we watched, so we desperately tried to keep up with him. I only got a few glimpses of him, but I kept seeing bits of bright orange fur in between the tree trunks, and that was enough to keep us all going. 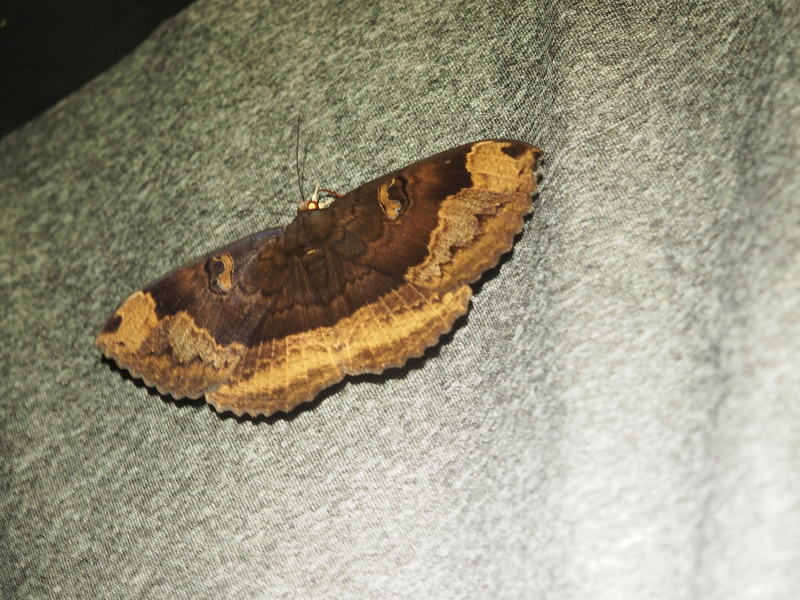 That evening, we decided to try the ‘light on a big sheet of white fabric’ thing to see all the amazing moths that we knew were flying around us in the dark. While we scrabbled around trying to find a big piece of something white and a light bright enough, we hadn’t realised that there were already tonnes of moths drinking all the sweat off our clothes hanging on the improvised washing line! I’ve got no idea what any of them were but they were all beautiful. Just as much as seeing the wild orangutans, these were the kind of moments I’d dreamed of before I came, the reasons I wanted to come spend a few days in the rainforest. Day three brought us no orangutans either, but we did have some amazing views and ate lunch under a waterfall. Not so bad. It started raining as we were finishing lunch and because we have to cross the rivers to get back to camp (which can get full very quickly) we cut the afternoon trek short and headed straight back to camp. Just as well really, by the time we’d got back and had a quick river bath, the river was rising fast and an area we’d crossed on foot previously had become a raging torrent! 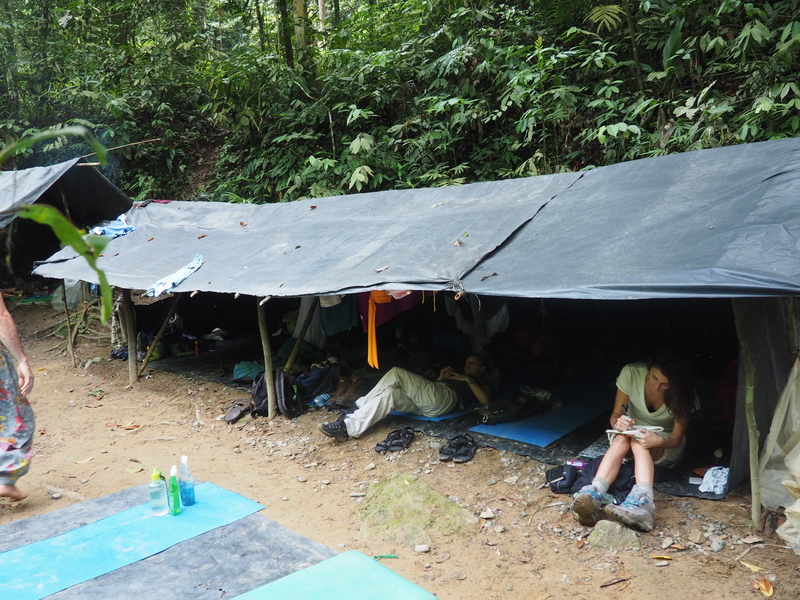 We all went to bed that night on the one hand praying the rain would stop so that our walk out of the forest tomorrow wouldn’t become a swim, but on the other hand hoping that we’d get stranded and have to stay another day or two. We woke to a clear morning, the river was back to more manageable levels, and sadly our time in the forest was over. The few hours trekking back out was a lot easier than the way in – for starters we were going downstream, but I really felt like in those short few days I’d already started to understand the ways of the forest, how to get around without falling over, what some of the strange sounds were and appreciate what an incredible environment it is. Spending 5 days out in the forest was amazing, it was what made me do this trip in the first place, more than seeing the orangutans. If someone could have delivered me some clean clothes (or if the humidity would of allowed me to dry some clothes) I could of stayed for weeks. I knew there was so much I could still see (I really wanted to go for a night time walk and see a slow loris! ), and bathing in the river, being surrounded by the huge trees, the noise of the insects and birds was everything I hoped it would be. I hope I can go back to a rainforest again at some point in my life. Click HERE for post three!